There’s one thing I will always remember about my Nana. I often stayed with my grandparents on the weekends. They fixed some of the yummiest meals like pork chops and gravy, hamburger vegetable soup, and fried potatoes and onions. 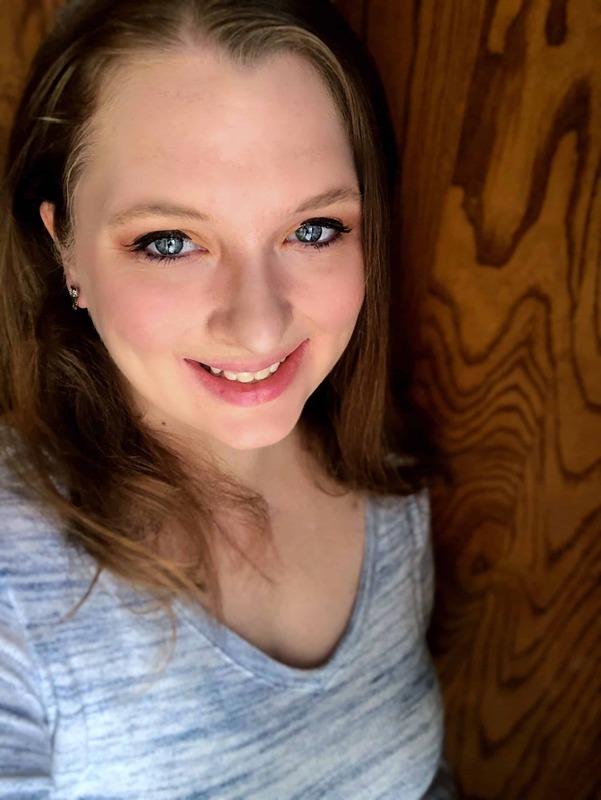 She could make some of the best fried potatoes and onions I’ve ever had. The food she always made was simple, but it was filling and yummy. She is a use what you have kind of person, and to make fried potatoes and onions, you don’t have to have much! I’ve made this recipe for my kids several times. It was a staple during my husband’s deployment. 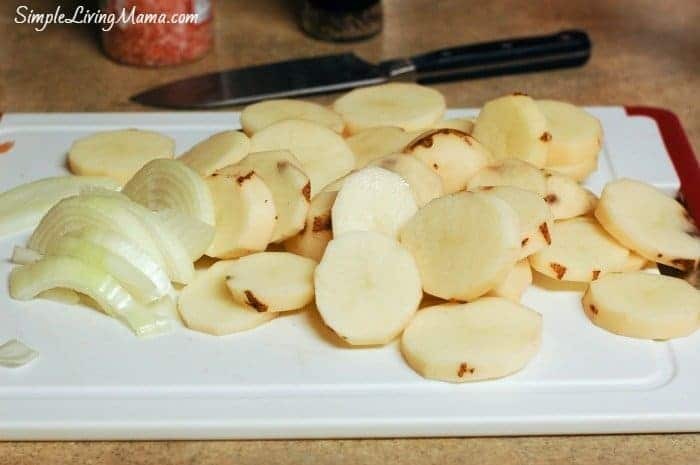 There were many nights I was too tired to cook a proper meal, and if my mom didn’t bring me dinner (she lived across the street) I would often make a batch of fried potatoes and onions. This dish makes a great breakfast food! You can even crack some eggs right into the pan while you’re frying up the potatoes to make it more filling. To start you just need to chop up a whole onion and about four potatoes. 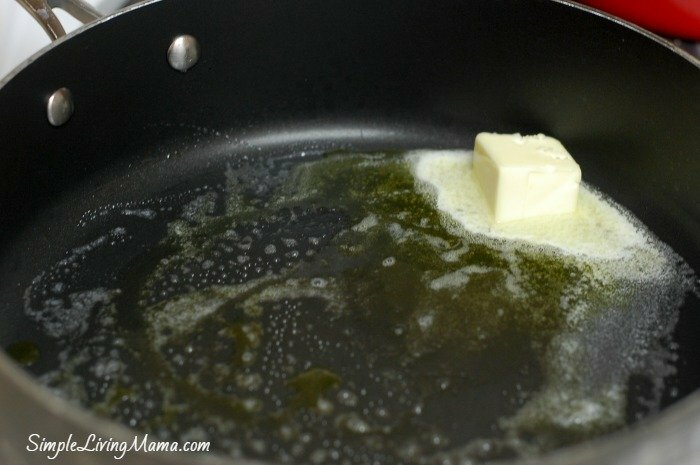 Melt two tablespoons of butter and two tablespoons of olive oil in a deep skillet over medium heat. Throw the onion and potatoes into the skillet. My skillet is a little crowded. Ideally, you want to get each side of the potato golden. 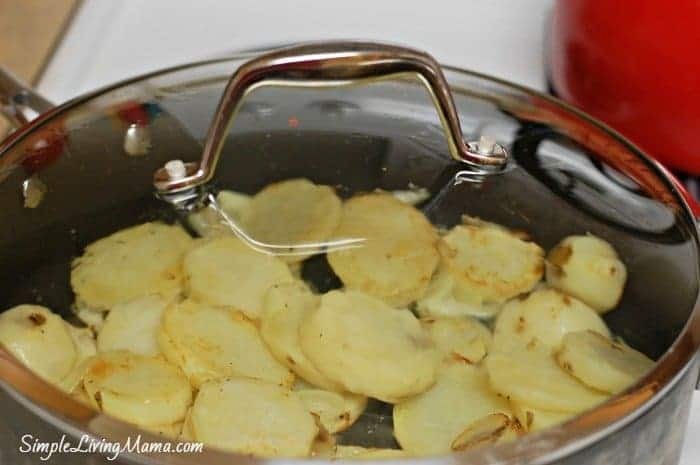 Once your potatoes have a good color on them, turn the heat down and put a lid on your skillet. Let them cook until soft. Putting the lid on the pan helps to trap in the steam so that your potatoes will become soft. And there you have it. 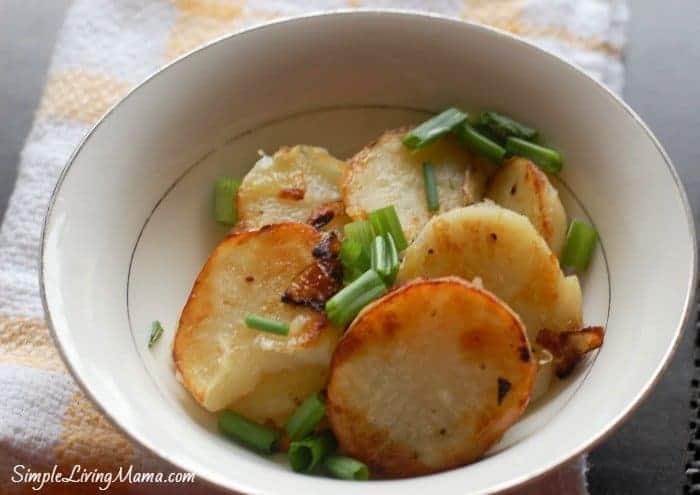 A delicious bowl of fried potatoes with onions. One of the simplest, yet a totally tasty bowl of goodness. I love serving these fried potatoes and onions with ketchup. 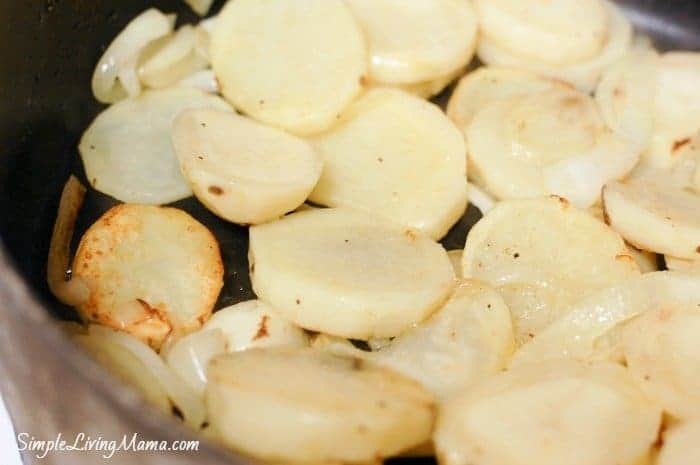 They are great on their own, or as an accompaniment to eggs and bacon, and like I mentioned earlier, you can just scramble your eggs right in the skillet while your frying the potatoes and onions. This is truly simple food. 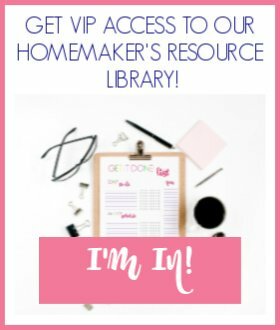 It’s frugal and pretty easy to make. Sometimes simple food is the best! 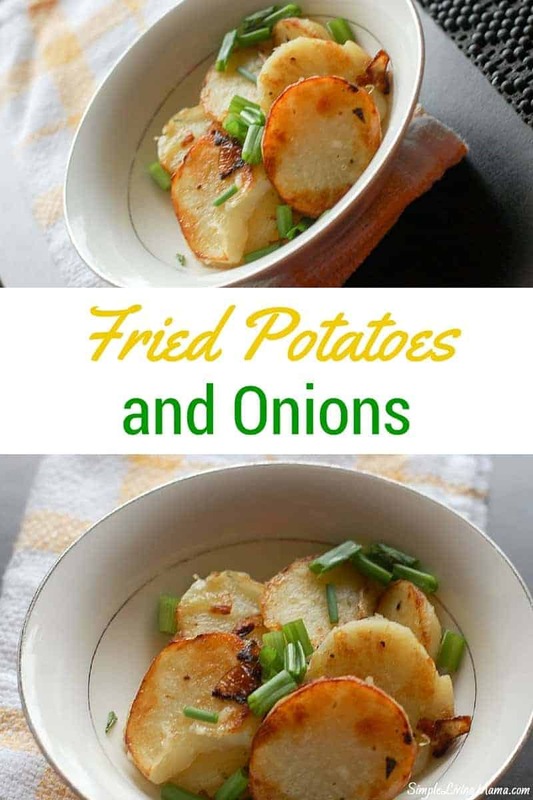 When I’m needing to create a quick meal, I reach for this fried potatoes and onions recipe. It’s perfect for breakfast or dinner! 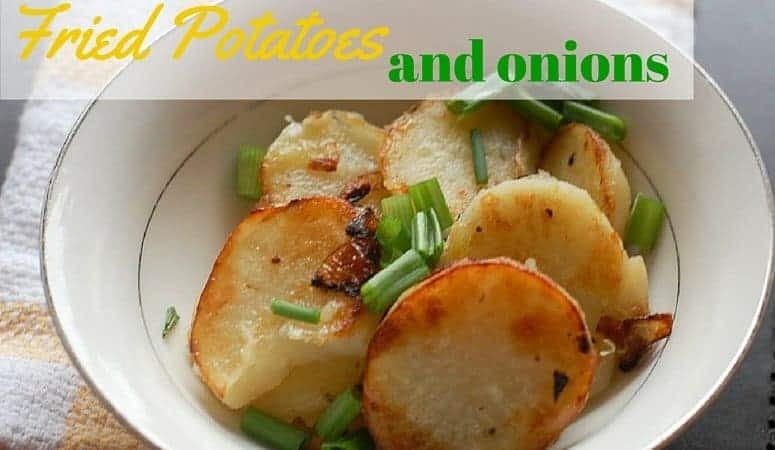 A simple, frugal meal of fried potatoes and onions. Chop up a whole onion and about three potatoes. Put the onion and potatoes into the skillet. You want to get each side of the potato golden. Let them cook until soft.